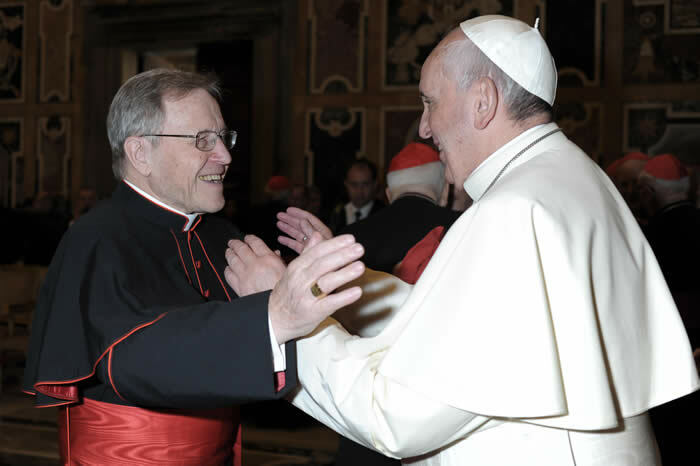 Vox Cantoris: Cardinal Kasper says "yes" to communion for adulterers. Will Francis correct him? Cardinal Kasper says "yes" to communion for adulterers. Will Francis correct him? LifeSiteNews is reporting that Heresiarch Cardinal Walter Kasper stated, "yes, period!" that the divorced and civilly remarried can receive Holy Communion. This is the malefactor that started it all in union with Bergoglio. This is also the man who spoke of how it could be different in Africa, but that those bishops, "should not tell us" really important and racist Germans who don't go to Mass, "what to do." A more salient example of a heretic in clerics I cannot name. Unless it is his boss. The timing of Pope Fruitcake's morning homily and Cardinal Fruitcake's recent publication seems to go hand in hand together... Are these two fruitcakes conspiring together, Or is it just a coincidence? I recall the words of St John Paul II, “There is no such thing as coincidence”. If anyone needs the lord’s help it is Pope Fruitcake, Cardinal Fruitcake and the rest of the Bergolian Fruitcakes! There was a time in my life when ai found myself divorced due to a cheating spouse who abandoned his family and later wanted to enter into "marriage" with another. In God's great mercy I was granted an anullment some years later. However, during the time of divorce and before the anullment I was encouraged by the devil/the devil's agents to receive Holy Communion anyway. I knew better. Everything within me sounded an alarm. There was NO WAY that I could believe these people or the devil that tempted me to listen to them. I am not soecial. I get the proddings of a guardian angel just like eveyone else. There is not a snowball's chance in HELL that Catholics who find themselves divorced are not aware that this is wrong. If they embrace this sacrilege it is not out of ingnorance but out of lust for sin. Do niot do this, People! Do not listen to these agents of the devil! Six days to go before Lund with the probability of the lifting of Luther's excommunication & still no warnings coming from our esteemed hierarchy. They are willing, it seems,to bring catastrophe on us all rather than do the right thing & call this papacy for what it is - APOSTASY. Yes, Ann, they will lift the excommunication of Luther and all his followera. Why? 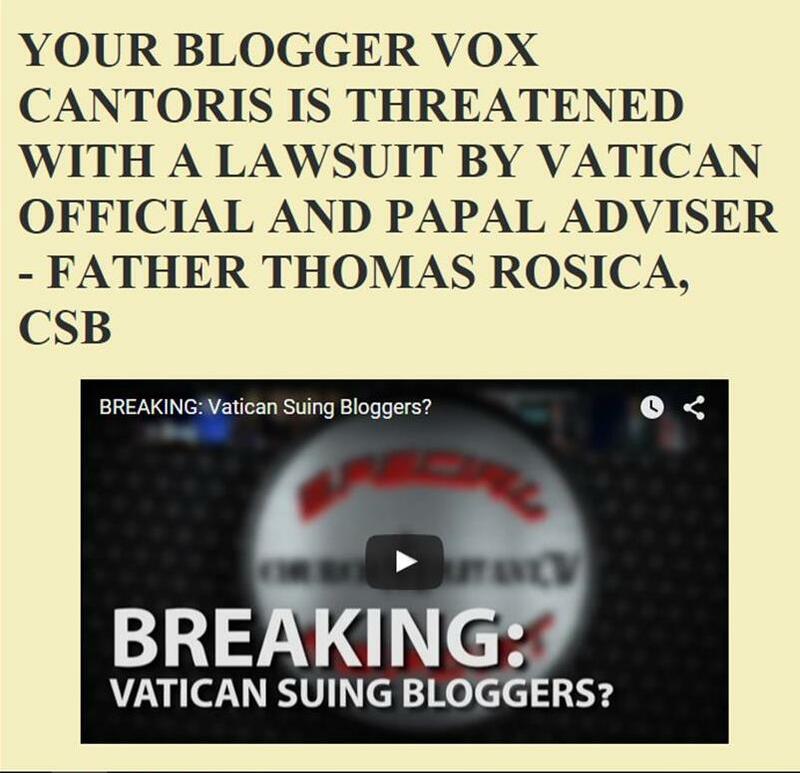 Because they cannot canonize the excommunicated. Not even with their phony canonizations. This is how the antiCatholic/Lutherites/Protestorants plan to become Catholic without convrsions, without submission to the Authority of the popes, without having to do a damned thing because they will wake up one morning and diacovwr that they are now "Catholic". They will not be, of course. Satan will dance because nit only has he fooled the u repentent heretics into damnation, he will effectively make the world think that the Catholic Church no longer exists. Lifting Luther''s excommunication? I'm expecting a beatification. Mother of Perpetual Help, intercede for us! St. Paul, St. John Fisher, St. Thomas More, come to our aid!! !